Dragon Age 2 Will Look "Super Hot"
Don't despair if the graphics of Dragon Age: Origins turn you off, BioWare intends to pump them up in the future. Without question, BioWare's Dragon Age: Origins is a well made game with a very deep story, but a segment of the gaming population has voiced complaints about its graphics. BioWare co-founder Greg Zeschuk says that the company is going to do something about that for the sequel, as he told Joystiq: "I can confirm that we're doing a lot of work on the Dragon Age engine, and doing a lot of stuff to pump it -- to make it visually super hot." I'm one of the lucky ones that was able to play Dragon Age as it should be played, on a PC, so I don't have any major complaints about the game's graphics, though they didn't blow me into next week. The majority of people's issues with the graphics stem from the Xbox 360 and PlayStation 3 versions instead. Mass Effect 2's graphics, on the other hand, are very impressive on the PC. Zeschuk says there is a reason for this: "Dragon Age is, in the structural sense, a fundamentally different game than Mass Effect ... You have to make different technical considerations." Dragon Age feels like a deeper game than Mass Effect 2, so maybe the graphics had to take a hit to keep all the other goodness in. These kinds of issues do come up, especially in console game development. However, as we can see with Mass Effect 2 (which made massive improvements over Mass Effect), BioWare knows how to use existing technology to renovate what's been done before. 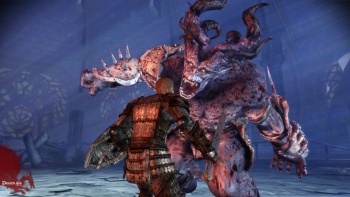 "I think the overall visual style we're going to continue to evolve in Dragon Age. People are going to see some cool ... I can't really say too much, but I think Dragon Age as a world is interesting." Do I smell a hint of cel-shading in that sentence, Mr. Zeschuk? In addition to adding "super hot" graphics though, I would appreciate it if BioWare could also fix one of my major Dragon Age: Origins complaints: having to constantly hold in the TAB key to highlight usable items and NPC names. Maybe I'm being a baby, but it bothers me, okay?